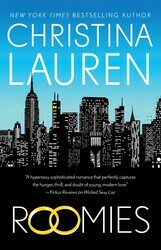 From subway to Broadway to happily ever after, Christina Lauren’s romance ROOMIES shows how a marriage of convenience can be… so inconvenient. Holland meets Calvin in a New Yorker's worst nightmare, a late night subway attack. Not only did he save his life but he's ridiculously cute... and talented... and Irish. Unfortunately, he's in danger of being deported unless they get married. Impulsively, she marries the Irishman, her infatuation a secret only to him. As their relationship evolves, will Holland and Calvin to realize that they both stopped pretending a long time ago?